UPDATE (Jan. 2018) - OLE is dead. 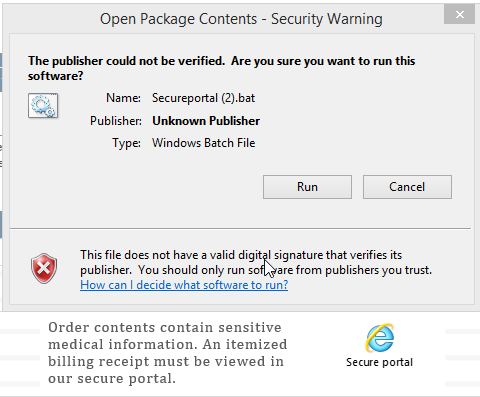 Microsoft has decided (finally) that executables, scripts, etc. are a bad idea to embed within Microsoft Office documents. If you try to do this on an updated Windows system, attempting to execute the OLE will result in a security error preventing anything from running (default setting). Instead, this method can be adapted to be used with DDE execution through Excel. Coming soon: blog post explaining this. Phishing engagements bring me both joy and heartache at the same time. Popping a shell on someones machine through a well crafted email just brings out all the feels (insert success kid meme). However, lately, it has become a headache as well. There are a plethora of different security solutions which block known payload signatures along with next generation AV which analyzes the payloads sent and flags for known bad behavior. IPS or edge firewall systems would inspect outbound traffic to ensure it was legitimate web traffic (HTTP/HTTPS), and only allowed egress over port 80/443. “Next Gen” antivirus such as Cylance or Carbon Black inspected all executable files for strange behavior. If an executable automatically established a reverse connection back to my server, the AV would detect it. PowerShell.exe was disabled for all users on their workstations. Executable files, Macro Office documents, or zipped files sent as an email attachment were stripped and the email was sent to spam. Executable files downloaded from the internet (such as exe, bat, or HTML Applications [HTAs]) were blocked by a web content gateway. After burning multiple phishing / vishing targets with different payload types, I realized I needed to think a little outside of the box. So, I obtained a machine running a next gen AV deployed in full blocking mode as well as a traditional AV installed, put up my own edge firewall and web content filters to mirror what I suspected theirs to be, and went to work in my lab on creating something to bypass these controls. I’ll start with this: what I came up with was not perfect or pretty. It is a mashup of some homegrown batch hacking and evasion/bypass techniques discovered by other people, all stitched together in a loose manner. Unlike simply enabling a macro, it really requires users to ignore security warnings. But, it worked, and out of 100 targets, I popped 4 shells in the first thirty minutes. OLE is a batch file disguised with another Microsoft product icon (Internet Explorer = win). Echos C# code into a text file which..
We then echo our C# code into a text file called 'secureportal.cs'. Edit the line which starts off with 'echo string stager' and insert your encoded PowerShell Empire payload. Note that you should only insert the encoded portion from the generated PowerShell Empire launcher stager. If you are unfamiliar with PowerShell Empire, see http://www.powershellempire.com/. 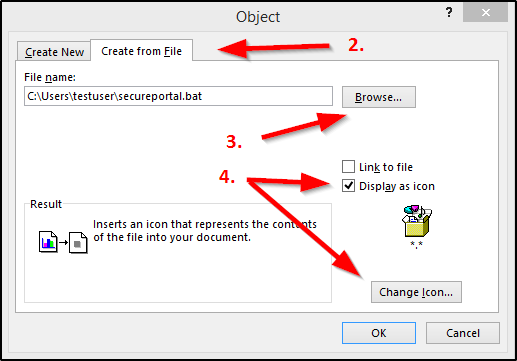 Microsoft Object Linking and Embedding (OLE) allows for objects to be embedded in an Office document, generally used to include another office document or PDF file within it. For some unkown reason Microsoft has allowed for batch files to be a part of this (but not .exes), making it a great way to deliver our payload. The batch file itself is not placed as a standalone file on disk until a user double clicks on the OLE, which then writes the batch file into the Office apps temporary directory under the name you attached it to the document as, in this case, secureportal.bat (this is also where our secureportal.cs C# code will be echoed out to). I initially tried including a .cs file as an OLE instead of echoing all of the code and then invoking it with the batch script OLE, but this then requires the user to double click on yet another OLE which would open the .cs file. Change the icon to something that fits your pretext. This can be a Microsoft Word document, Internet Explorer icon, etc. For my pretext I am asking targeted users to open a 'secure' sign in portal on the internet to view sensitive content, so I use Internet Explorer's icon. If you enter the path to iexplorer.exe and select okay, an option pane will provide you with a bunch of different IE icons (C:\Program Files (x86)\Internet Explorer\iexplore.exe). I'll leave this part as an exercise for the reader, simply because there are a plethora of ways to do this. I've found that emailing the word document with the OLE included gets through email spam filters 9/10 times, with the 10% failure rate often attributed to companies not accepting emailed documents from unknown senders or those without a valid SPF record. If the email seems to be getting blocked, try sending a link to an AWS S3 bucket hosting your office document and coerce the user into clicking on the link, downloading the file, and running it. Below is an example document that has been used a few times. 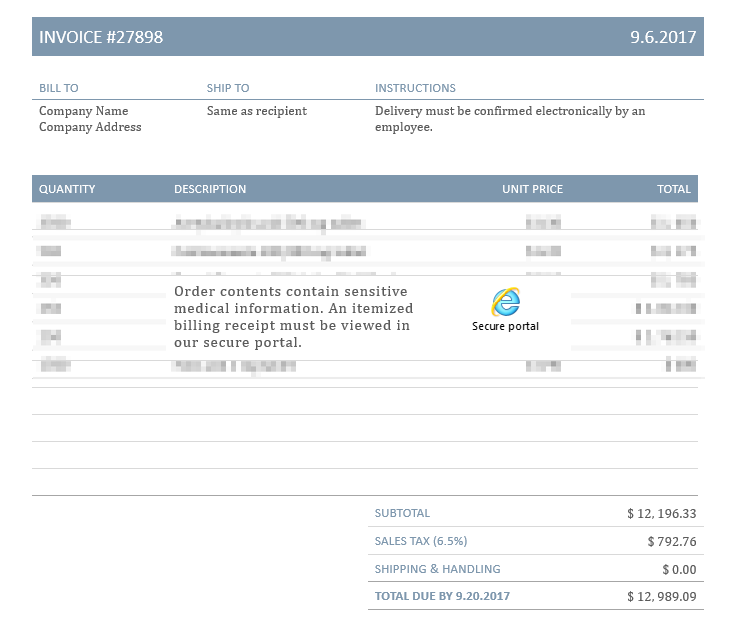 We populate the fake shipping information with company name and relevant items to the users we are targeting. For example, if we target a medical company, we may say that specific drugs being shipped are regulated and therefore the delivery schedules and names require access to a secure portal. Including a high dollar amount for the invoice often leads to curiosity killing the cat, as the target panics and quickly reacts, opening the document without thinking twice. Hope this helps on an upcoming phishing engagement where everything seems to be failing.